Here's how you can both track down and kill the Diablos in Monster Hunter World as easily as possible. The Diablos might possibly be the strongest creature in all of the Wildspire Waste region of Monster Hunter World. In our Monster Hunter World Diablos guide, we'll be compiling all the information you could possibly need to know about the powerful creature. If you need anything else at all on Monster Hunter World, including how to safely capture a monster for rare parts, or how to quickly track down a monster using the Scout Flies, make sure to check out our Monster Hunter World guides walkthrough hub. The Diablos is at the very peak of the food chain in Monster Hunter World’s Wildspire Waste area, which is saying a fair amount, considering the land is home to the likes of the Barroth and Rathian. If you start from the northeast Camp in the Wildspire Waste area, all you simply have to do is head into the open desert area just to your north. The Diablos is nearly always guaranteed to be here, but even if it isn’t, you’ll still find plenty of tracks and markings that will let the Scout Flies lead you straight to the monster. The Diablos is the prime predator of the Wildspire Waste, and this means that it will attack any other monsters on sight. 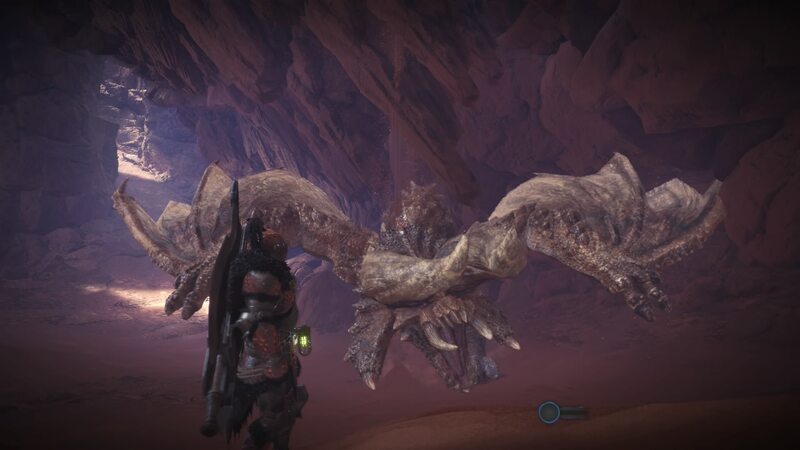 As you’ll see in the opening scene of the ‘Horned Tyrant Underneath the Sand’ quest, the Diablos can take down a Barroth in one bite, and it’ll make short work of the powerful Rathian. The nasty trick that the Diablos has up its sleeve is that it can tunnel under the sand at a moments notice, travel a fair distance, and then re-emerge underneath the player or any monsters, dealing massive damage in the process. Killing a Diablos in MHW is no small feat. You’re going to want to use weapons that either allow you to move around incredibly quickly, or attack from range. We’d recommend the Dual Blades due to their rapid attacks, the Bow due to its ranged ability, or the Insect Glaive because of its aerial abilities. 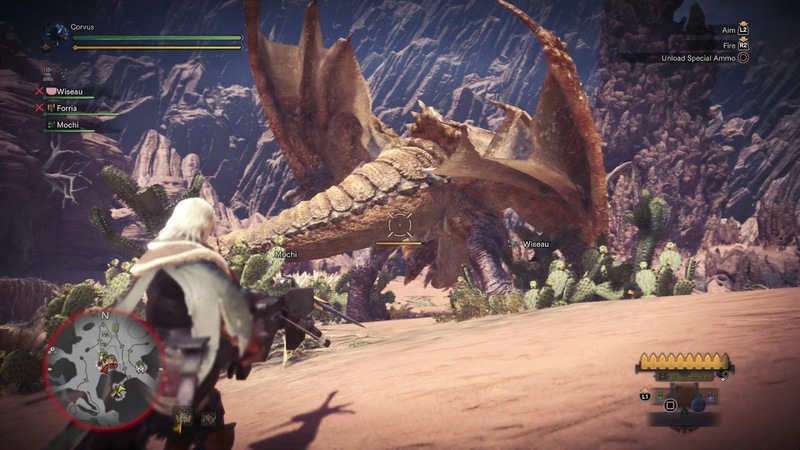 If you’re skilled enough with the Insect Glaive (see our full Insect Glaive guide for help), you can potentially vault and land on the back of the Diablos, although don’t attempt this while the beast is moving, as it’ll hit you in midair. When the Diablos burrows underground, instead of running directly away from the monster, run around it in a circle, so that when it tunnels towards you and erupts out of the ground, it’ll miss you if you’re running sideways. Outside of this, the Diablos mainly specializes in lunging attacks, charging headfirst at the player very quickly. Its charge attack is difficult to avoid, especially if you’re in close proximity to the Diablos, and so we’d recommend keeping a fair distance when you can. The Diablos doesn’t have one, true weakness, but it is particularly prone to being mounted and attacked from above. The best way to do this is obviously with an Insect Glaive aerial attack, and if you manage to land on the back of the monster, it’ll put little effort towards shaking you off. If you’re going after the Diablos with the Bow, let your Palico draw its attention with a few attacks, and then lay into it with the charged shot, aiming for either its head or wings. Due to the sheer ferocity of the Diablos’ attacks, you’re going to want to go with the armor that gives you the best defense rating. We’d recommend the Odogaron armor set, not only because it has a fantastic defense stat of 156, but the set skill bonus increases this rating by +5. We might be done with our hefty Diablos guide for MHW, but why not continue ahead to our additional Monster Hunter World guides, including our complete armor guide, as well as our Wildspire Waste guide.